There's a romhack named Final Fantasy IV:Playable Golbez Edition by fedorajoe and I wanted to use Project II as a base for Playable Golbez Edition to be upgraded because were are currently on version 2.1. What popped into my head is that the Ebony armor retranslates to Black Armor. The Ebony Shield will have KO immunity and it is used only for Golbez. Imposter is the Japanese Translation for Darkside as the enemy Darkside is Golbez's Imposter. I know that Project II can be used to a base for other projects so that can help Rick K's Golbez Edition romhack. -Rodimus Primal for the script especially some new scenes exclusive to fedorajoe's Playable Golbez romhack. -You for Project II as base for other projects which can improve Rick K's Golbez Edition romhack. -Golbez using the Crystal so I can never hear Zeromus taunting Golbez again. -An improved script for new scenes exclusive to fedorajoe's Final Fantasy IV romhack. If you guys watch Scratch Point's playthrough of Final Fantasy IV: Playable Golbez Edition, then you may agree with me. That is an astronomical fuckton of work to be done. I wouldn't be opposed if fedorajoe himself came to me with the idea of using Project II in an update to Playable Golbez Edition, but as it stands, I don't think I would want to go out of my way to do it myself. Plus, I can see it being a mess; there would be things fedorajoe would want to changed that I would want to leave unchanged or change in a different way, and Rodimus of course would have his own vision if he were to help. And chillyfeez has his own life and own FFIV (And non-FFIV.) projects on his own plate, so I'm not sure if he would be able to help with this theoretical patch update. As for the script--I'm actually the one who wrote the entire Project II script. Rodimus Primal, to be sure, inserted a few updates to better integrate the Japanese FFIV changes to the Project's dialogues, but he didn't really have anything to do in the script writing process. I appreciate the ideas, and they are very lovely, but I can't really do anything like that. - Fixed a graphical glitch on the title screen. Compare the old screen to the new one. - Reverted the curse-curing item's name to Cross. I dislike any other name for it. - Updated the terms of Fusoya's Regen command in the Supplements to be a bit more vague, since I've heard in one place that its active time is based on his Agility. You can get the update over here! It's also been submitted to RHDN. Edit - Now on RHDN. Rydia: Give your power to Meteo! I really have no intention of touching fedorajoe's project, just to be clear. I would never mess with someone's project without their permission first. I've not even had the chance to PLAY Golbez Edition let alone even think about touching it. The dialogue work I did with Namingway Edition was done to make it closer to the Japanese FFIV and I asked vivify93's permission to even MAKE the project since Project II was used as a base. Back on this topic, nice work vivify93. Always glad to see good updates to any worthwhile project. 1) I made User Options, but as far as I'm concerned, it now belongs to everybody. The patch is there on RHDN and you're welcome to use it in any project. 2) I think I might have a b-button dash patch lying around that can be applied to any hack with User Options. I think I made it for Rodimus to get B-dash into Namingway Edition. 3) those things are easy enough. Really not any more work than I've already done, so I don't mind helping you out there. The title screen, on the other hand, is kind of a thing. Whereas I now have enough experience that I'm confident I could do something for you, it would still be at least a couple of days' work. Unless this project were to move beyond the theoretical, I couldn't commit to it. And if I did agree, you'd still have to do the design - I'm not particularly good at that sort of thing. I'd be helping you integrate an already a existing design into the game. 4) you should really start a new topic for further discussion of this project. Off topic, but I've always found the attitude towards using someone else's hack as a base for another hack to be completely contrary to the very concept of ROM hacking to begin with. Aside from the basic politeness of INFORMING someone that you intend to use their work as a base, permission really seems to be besides the point of the entire endeavor. Credit where credit is due, but if an initial hack falls under "fair use" how can a hack of a hack not full under the same rules? I think I might start a thread about this. I tend to agree, hence point 1 in my previous post. I'd suggest you guys check out Final Fantasy IV: Playable Golbez Edition! 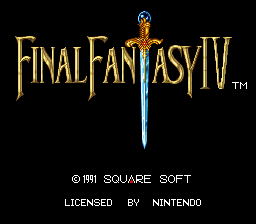 I'm going to be playing FFIV for my first time. Should I use this version? 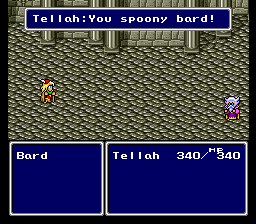 And are more famous lines, such as "You Spoony Bard", in the game? It also makes for one helluva good base for projects as well! I left that particular line alone. Finished the game, wondering if you can give me permission to translate your version to Brazilian Portuguese. It's really great! Even have some tools ready. Hi Steve, you have my permission to translate it, but please keep in mind that Project II isn't a translation, but a "script rewrite." So my script may not be the most accurate compared to an official translation. To wanna be the spoons. The prince of rubble croons. Small update; here's the post on it pulled from Namingway Edition's page. Look what I overlooked in Project II. 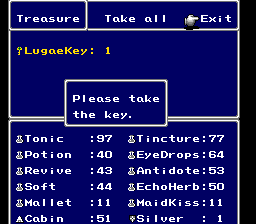 If you try to leave a key item after battle, it's supposed to say something like "You can't leave this key item behind." Instead, it's just garbage. I'll let you know of a fix. I'm gonna write a small guide on how to fix this for anyone who might need it in the future. 3. If you're using a table file, type the ASCII "Please take" without the quotation marks. Then type in the hex bytes 01 52 03. Switch back to typing in ASCII and enter "the key." with the period, but without the quotation marks. 4. The new message should display perfectly fine. This is implemented in Project II now as well; v2.14 has been submitted and is awaiting approval. Thanks to Tomato for pointing this out to me, inadvertently or not. Edit - v2.14 is now live. v2.15 is out. Not much happened. - Fixed an improper indentation on the "leaving key item behind" text. - Tiny typo fix. On the save screen, the message "Failed......" can appear somehow. I changed that to "Failed..." using the il digraph. I removed the digraph from this message since it didn't need it. - Minor changes to how status names are treated; in later FF games, namely XII and XIII, statuses in menu descriptions are capitalized. e.g. "Randomly inflicts Stop upon striking an enemy." So I changed that up real quick and the Supplements have been updated to reflect that. - Small updates to the Supplements. Nothing major. Honestly, I made this update because I noticed that I had misspelled "efficacy" in one of the changelog descriptions, and... turns out I forgot to fix it when uploading the new ZIP. Whoops. Oh. And obviously, I won't be doing a remake of the English manual to go along with Project II; I realized the Supplements may be text-only but it accomplishes pretty much the same thing that the original FFII US manual does. Another update. The whole reason I made v2.15 was actually so I could have an excuse to fix a typo in the readme. I didn't do that. Whoops! That's done, and I also did a few other things. It's been submitted to the site as per the usual. I have been comparing back and forth this project and the naming way project and I am trying to figure out which version is the most definitive version of FF IV? 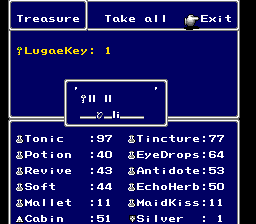 Like I see that one focuses on translation where the other has more updated keys and stuff. So if I were to collect the absolute closest version to the definitive original. Which version is the one I should aim at? I apologize if the question seems redundant, I just got confused trying to compare the two. Hey there Sephirous, thanks for your interest in Rodimus' and my projects. To sum things up, it's down to taste. Namingway Edition is based off of Project II, and thus uses its script for the most part. The v2.20 update changes haven't been implemented into Namingway Edition yet--they may not be since it's up to Rodimus' discretion--but pretty much, it's the same script with some minor alterations. As for gameplay and exploration, I did do the following. I did not do any of the below. Rodimus Primal actually based Namingway Edition off of Project II with the goal of having a modernized FFIV experience. He and his friends did all of the above that I did not do, plus more. If the latter appeals more to you and you have no nostalgia for FF terms circa 1991, I say go with Namingway Edition. It's a really polished job considering the limitations Rodimus had to suffer with! However, if you'd like a bit neater of a presentation plus my original intent, Project II is the way to go. There's something I must point out though. While Project II's script takes inspiration from the PS1, DS, GBA, and PSP translations, it is at its core a rewrite of Kaoru Moriyama's original translation from the SNES. It is by no means a retranslation. I replayed the opening recently and while I'm still very happy with my work, it's obvious that things have been pared down from what they once were, and it just doesn't have that solid fantasy feel to immerse you in the world. If you want my honest-to-god opinion, though, I recommend the PC version above all. The new battle system is leagues above the original and the Augment system is great fun. Just give it the original soundtrack mod and the 25 FPS Battles mod though, for the love of all that is holy! 15 FPS battles are nearly unplayable and the "remastered" soundtrack is awful in my opinion. Thank you very, very much for explaining all this in great specific detail! Going to try either SNES version. I replayed the opening recently and while I'm still very happy with my work, it's obvious that things have been pared down from what they once were, and it just doesn't have that solid fantasy feel to immerse you in the world. Just nitpicking for my own "documentation" purposes. I like to keep detailed notes (+,-,tcrf,extras,problems) about games + hacks I use. Sorry if it's a bit nuisance.